Kitchen edition today! I have to say the kitchen was the easiest and took the least work to renovate! Sadly, I only took two before pictures of the kitchen because there wasn't a ton of work needed! 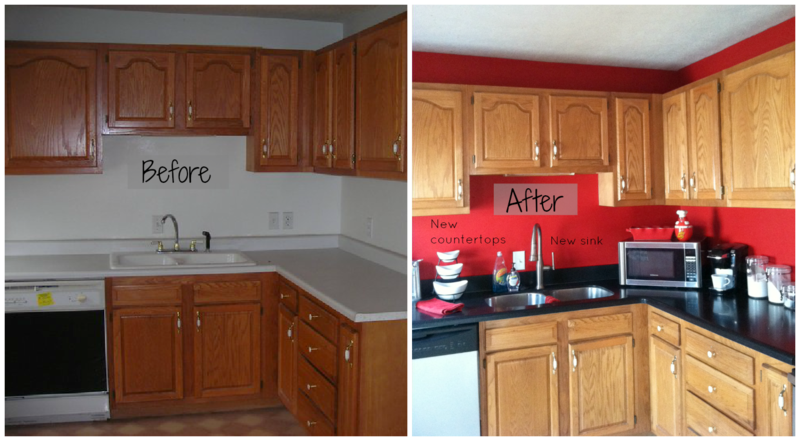 I had always wanted a bright red kitchen and at first my hubby was on the fence but then he decided it would be my kitchen where I spent my time and made all my masterpieces ;) so he caved! Now we're both SO happy with it and I can't imagine it being any other color! My kitchen is seriously, "SO ME!" We still need to install our back splash It's a checkered pattern with black, light grey and clear glass! It's so pretty! That is our next project for the kitchen! Like I said, not a lot of work, just small jobs here and there and a lot of upgrading! I have a feeling that the back splash will be the hardest to do! love the red! 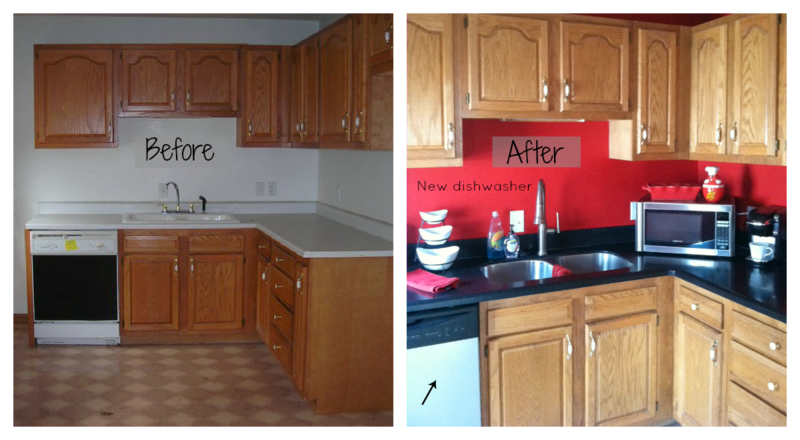 I don't know if I have ever seen a red kitchen - looks great - such a difference from the 'before' pic! O I love it!!!!! i love the red! i am loving your house tour posts!! i think the older we get as women we love looking at others womens homes.. and the kitchen is right where we spend all of our time so I don't blame you for keeping the red! I love your kitchen and color - looks just like ours. 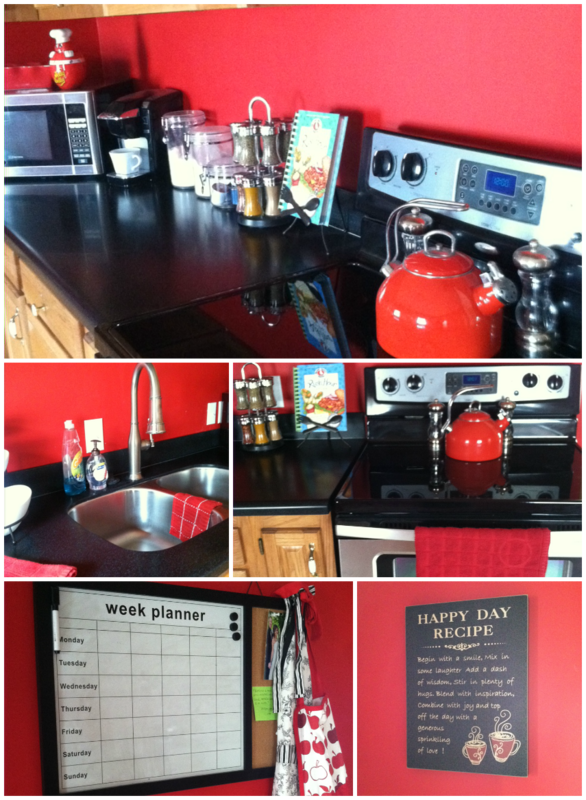 Something about a red kitchen with all black appliances! Looks nice! I'm not a huge fan of red usually, but I think it works well in your space. Are you planning on painting the cabinets and updating the hardware, or sticking to what you've got? That's first on my list of things to do in our kitchen, but we've got the ugliest gross cabinets that can't even be salvaged with paint and pretty hardware :) Nice work! I love it! Everything in my kitchen use to be red too, then we bought a house and my husband was just positive we should paint the kitchen grey...haha so seeing your bright fun kitchen makes me smile!! Hey! It looks GREAT! I especially love the week planner! The red looks amazing too! What a huge difference! I really like the black countertops against the red!! I have always been wishy washy on using red on walls but this looks absolutely amazing and like something I would see on pinterest! love love love it! looks great! would you like to follow each other? let me know! love the new kitchen updates! It's fun to see what a few changes can do and how those small changes can really make you love your space again! ah! I'm loving this!! Good work girl!! Newest follower!